For sheer convenience, the four-star Savoia & Jolanda is hard to beat: The highly-regarded waterfront hotel is directly across from the Alilaguna Linea Blu airport-boat stop at San Zaccaria, and it's only a short walk to the Doge's Palace and the Piazza San Marco along the Riva degli Schiavoni. All 51 rooms and suites have Wi-Fi, and on sunny days, you can enjoy breakfast on a terrace facing the island of San Giorgio Maggiore. As you leave the boat station, walk straight ahead across the level pavement to the hotel entrance. As you leave the boat station, walk across the level pavement to the hotel entrance. Leave the terminal by the main doors, walk to the wooden bridge, and cross the bridge. Catch the No. 2 vaporetto toward San Zaccaria at the ACTV water bus stop, which is just beyond the bridge. 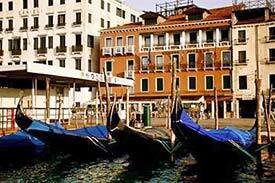 Get off at the San Zaccaria ACTV stop, turn left, and walk toward the next set of waterbus platforms. The Savoia & Jolanda is directly across from the pier.